When I was a little girl from age 4 to 10, we lived in a very wonderful neighborhood conveniently located from school. Mama, too, was able to walk to the small fruit and vegetable stand that Papa and Mama owned but was managed by Mama during the day. There were many children my age living in the neighborhood so there was never a lack of “whom am I going to play with”? On the block where we lived, there were eight houses. There were four houses in a row that were occupied by Japanese. The first house was on the corner, occupied by Mrs. D, who was a widow and a wonderful seamstress. She lived with her two grown and professional sons. One was a lawyer and the other a real estate broker. Mrs. D was an immaculate housekeeper. Next to her lived Mr. & Mrs. Y, who were like grandparents to my brother and me. They had three sons — two grown sons who were involved in the produce/food business and also an adolescent son. Mrs. Y took advantage of her spacious backyard and planted nappa (Japanese cabbage), daikon (radish), eggplants, string beans, tomatoes, green onions and carrots. She loved her vegetable garden. The third house was occupied by the Rev. 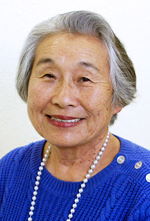 & Mrs. N, the Japanese-speaking minister of what was then known as the Japanese Congregational Church. He had a loquat tree on the side of the house. We children used to climb the tree and help ourselves to loquats when the reverend was not at home. The house next to the reverend was where my family of five lived, which consisted of Papa, Mama, my two brothers and me. Next to the side of the house was an archway that had wild blackberries growing over it. On the other the side of the house, Papa grew sweetpeas and we would “get it” every time we snapped the bud. Mama planted only string beans in the backyard. She preferred raising rows of dahlias and roses rather than vegetables, except she did plant string beans. When the dahlias and/or roses bloomed, she would make a beautiful arrangement that decorated the living room. Oh yes, we did have a black and green fig tree in the backyard. There was a gum tree on the side of the house. When I was reprimanded by Mama or wanted to be alone, I would climb the tree and find my haven of rest. I would lean against the branch and was at complete peace, watching the clouds and daydreaming. Across the street from the four houses was a business called Butler’s Feed Mill. Mr. Butler was also the landlord of the four houses. There was a huge parking area behind the business and we children would take advantage of the space after business hours and on Saturdays, Sundays and holidays by playing football and baseball. Next to Mrs. D’s house was a slight slope and we children would race up and down the slope. We would skate, ride our bicycles, jump on skate boards and have the time of our lives. The commandment of “Love thy neighbor” was honored by those who lived in the four houses in a row. The memories of those happy childhood days will always remain in my heart.